The mosaic is part of Cassini’s ‘Wave at Saturn’ campaign, where on July 19, people for the first time had advance notice a spacecraft was taking their picture from planetary distances. 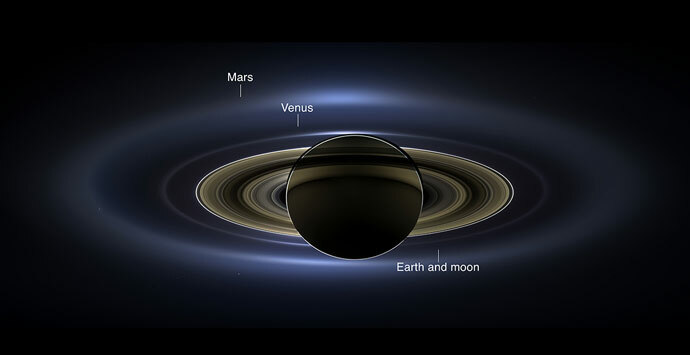 NASA invited the public to celebrate by finding Saturn in their part of the sky, waving at the ringed planet and sharing pictures over the Internet. With both Cassini’s wide-angle and narrow-angle cameras aimed at Saturn, Cassini was able to capture 323 images in just over four hours. This final mosaic uses 141 of those wide-angle images. Images taken using the red, green and blue spectral filters of the wide-angle camera were combined and mosaicked together to create this natural-color view. Image credit: NASA/JPL-Caltech/Space Science Institute.